At the risk of stating the obvious, if your ical file is stored remotely, you do NOT want your website fetching it every time someone browses to a page with the events. This could really slow your website down. 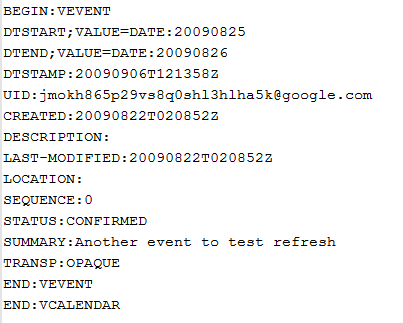 Therefore the amr ical events plugin caches the ical file and allows you to specify how frequently to update the cache. If you update events once a week, then 24 hours may be adequate. Of course you can also make a manual refresh happen any time. A default refresh period or cache value in hours is specified in the admin menu configuration. Consider your update frequency when setting this value. If cached file is older than the cache value on the next request, the file will be refetched. If you have the refresh icon displayed on your calendar page, or widget, click it – it will force the ical file to be fetched again. 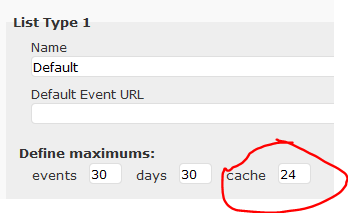 Hover over the refresh icon to see the last date and time that the cache was refreshed. NOTE: there have been times when the file re-fetched has not yet been updated by the ical generator – this is NOT the plugin’s fault. To check whether that is what is happening, save the ic file to your pc and edit with note pad – see if your update is inside. If you do not have the refresh icon displayed, then add a “?nocache” or “&nocache” to your url depending on your wordpress url permalink structure and refresh the page. In most cases this should cause the plugin to refresh. Delete the cache file itself – in your uploads directory, look for amr-ical-events folder and delete the contents – that will cause a refresh as though it were the first time. Of course by the time you have read all of this and etc, it may have refreshed anyway!